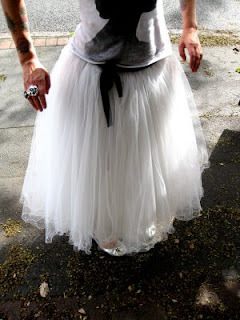 OMG, if I was getting married again (to my darling husband, of course) with the hindsight I do now, I would absolutely take myself 1000 times less seriously and don this fabulous skirt/tee combo for weddingish excursions. The tiny silver flats seal the deal. Image courtesy one of my favorite blogs, Absolutely Beautiful Things.